To those who wonder "why dig the past": We engage in revisiting and revising our past, i.e. historical "revisionism", to develop new emphases and raise new questions on assumptions and explanations for key historical issues and policies --given by our former colonial master America, our Americanized government officials and authors of standardized/official history books, then and now. The below article is about the notorious, brutal historical event of Balangiga Massacre aka Balangiga Bells. This slaughter of Filipino civilians was committed just about a decade after the Wounded Knee massacre. The murderous acts show a persistent pattern. Remember that the US military has a history of brutality towards noncombatants/civilians. 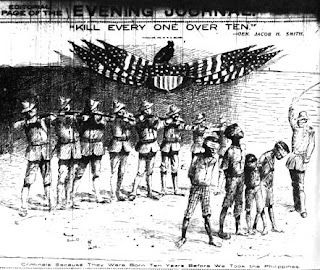 Military brutality towards civilians has been committed against Native Americans ("Indians" - as called by Columbus upon "discovering" America as he mistakenly believed he has found the Indies) within a few years after the American Civil War. Such acts were demonstrated by General Philip Sheridan in his several battles during the so-called "Indian Wars" to whom the famous quotation is attributed:"The only good Indians I saw were dead" aka "The only good Indian is a dead Indian," or the slaughter ordered by Colonel James W. Forsyth in the Wounded Knee Massacre, to name two. The standard version of Indian-American history is one in which heroic soldiers and frontiersmen, accompanied by their brave wives, resisted the ferocious raids of blood-thirsty Indians. Criminals Because They Were Born Ten Years Before We Took the Philippines. This editorial cartoon, from the May 5, 1902 New York Evening Journal, was drawn in protest of the burning of Samar, in late 1901, during the American occupation of the Philippines. News of the campaign eventually reached the United States, and the commander, General Jake Howling Smith, faced a court martial in May 1902, on charges of conduct to the prejudice of good order and military discipline. During the trial it was revealed that Smith had ordered his soldiers to shoot anyone over the age of ten who had not surrendered, as potential enemy combatants. Smith, found guilty, was given a verbal reprimand and retired without further punishment. The campaign on Samar was carried out in retaliation for an attack on American soldiers in the town of Balangiga on September 28, 1901. A group of Filipino insurgents armed with bolo knives attacked Company C of the Ninth U.S. Infantry, which the U.S. government had sent to Samar in order to occupy Balangiga earlier that year. The soldiers were outnumbered and taken by surprise while eating breakfast; 48 American soldiers were killed in combat and 22 were wounded. Some of the surviving soldiers managed to secure their rifles and fight, killing about 30 Filipinos and escaping to the garrison in Basey. In retaliation for the attack, American marines under the command of General Jake Howling Smith were assigned to clean up the island of Samar.General Jake Hell-Roaring Smith’s campaign was poorly planned and faulty in its execution. 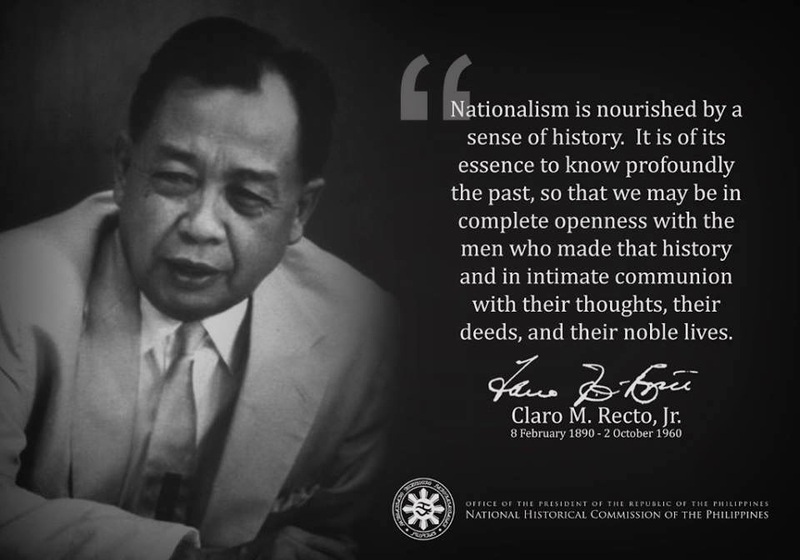 Convinced that he could make Filipinos submit to American control by making war hell, he sought to substitute fire and sword for the benevolent and humane policy that had preceded his campaign. General Smith instructed Major Littleton Waller, the commanding officer of the Marines assigned to cleanup the island of Samar, of the methods he was to employ: I want no prisoners. I wish you to kill and burn; the more you kill and burn the better it will please me. He directed that Samar be converted into a howling wilderness. All persons who have not surrendered and were capable of carrying arms were to be shot. Who was capable? Anyone over ten years of age, according to Smith. At this point he became better known as Jake Howling Smith. What followed was a sustained and widespread killing of Filipino civilians. The basic elements of his policy were few. Food and trade to Samar were to be ended to starve the revolutionaries into submission. He instructed his officers to regard all Filipinos as enemies and treat them accordingly until they showed conclusively that they were friendly by specific actions such as revealing information about the location of revolutionaries or arms, working successfully as guides or spies, or trying actively to obtain the surrender of the guerrillas in the field. General Smith’s grand strategy on Samar involved the use of widespread destruction to force the inhabitants to cease supporting the guerrillas and turn to the Americans from fear and starvation. He used his troops in sweeps of the interior in search for guerrilla bands and in attempts to capture Lukban, but did nothing to prevent contact between the guerrilla and the townspeople. American columns marched all over the island destroying habitations and draft animals. Major Waller, for example, reported that in an eleven-day span his men burned 255 dwellings, slaughtered 13 carabaos and killed 39 people. Other officers reported similar activity.The orders issued by the general and his emotional statements at the beginning of the campaign had encouraged such unproductive acts. As the Judge Advocate General of the army observed, only the good sense and restraint of the majority of Smith’s subordinates prevented a complete reign of terror in Samar. Still, the abuses were sufficient to cause outrage in the United States when they became known near the end of March 1902. After receiving his orders from General Smith, Major Waller issued his own written orders with regards to his men’s conduct, what they were to seize and destroy, and other matters of similar nature. Towards the end, he wrote, We have also to avenge our late comrades in North China, the murdered men of the Ninth U.S. Infantry. This added more to the rage. The Chinese and the Filipinos were, it seems, of the same nature, and stock, and even ideology. There was no difference among Asiatics. Waller was later accused of ordering the execution of eleven native guides because during a long march, they had found edible roots and had allegedly conspired to keep this knowledge from the famished American troops. In American history textbooks, the phrase Balangiga massacre is still used to refer to the combat deaths of 48 American soldiers, not the retaliatory slaughter of thousands of Filipino civilians. Well I am just one white American who has heard this story before and it is a shameful one indeed. There is much more to tell. Had I been there during that time, I would have deserted and defected and would have set out to kill as many of my former commarades as I could.